In response to God's love, grace and truth: The Purpose of InterVarsity Christian Fellowship/USA is to establish and advance at colleges and universities witnessing communities of students and faculty who follow Jesus as Savior and Lord: growing in love for God, God's Word, God's people of every ethnicity and culture and God's purposes in the world. InterVarsity traces its roots to a movement of British university students in the 1870s. 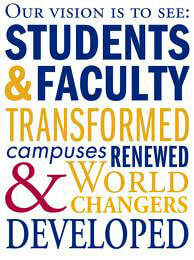 The first InterVarsity chapter in the United States began in 1938 at the University of Michigan. Since InterVarsity was incorporated in 1941, thousands of students have become thoughtful representatives of God’s kingdom and have moved into leadership roles in churches, organizations, corporations and agencies around the world. For more information, you can check out the national movement's website at www.intervarsity.org.